This tour is only available during winter special, it is a “limited edition” with key focus of Hakuba region & light up illumination visit. Hakuba is located in the mighty Northern Japan Alps.Hakuba was the host of the 1998 Nagano Winter Olympics. Hakuba definitely gained its’ famed as one of Japan’s top winter resort getaways. The abundant of snow falls and excellent powder conditions make Hakuba an enduring top choice of skiers and snowboarders from around the world. This group program will include a basic 2 hours learn to ski lesson, it is coupled with scenic sightseeing, food indulgence, onsen experience & light up illumination tour. Upon arrival, take a morning drive to Gunma prefecture which is located right at the center of the Japanese islands. First stop at Glass-themed park to watch professional’s hand-work from close distance as to how glassware is created. After the demonstration from the craft man, it is time to experience the DIY glass sandblasting with guidance as your take away gift. Sandblasting is a smoked glass effect created on the surface of the glass by blasting it with fine grain sand at high pressure. You may choose your favorite pattern to cover the glass surface to make it uniquely to your own. After lunch, embrace the stunning winter scenery en-route to Nagano prefecture. This evening, check into the Onsen Resort in Nagano for a good night sleep. Please ensure to soak into onsen for a rejuvenate experience especially from a long day traveling from home. 01Dec – 20Dec (start from 4pm): Enjoy sparkles light at Alps Azumino National Government Park. As you travel towards to Hakuba Ski Resort this morning, make a stop at Soba restaurant to experience DIY Soba making experience. Nagano Prefecture is known for its fresh water, which is then used to create delicious Soba noodles. Learn from soba chef how to make and cook soba noodles to be your sumptuous lunch together with Tempra! Next, do a brief stop at Lake Aoki which is a deep and clear lake fed by snow-melt, rain, and mineral springs from below. The tour continue to Oide Park, here you could admire the spectacular scenery with Japan Alps. Thereafter, ascend to the newly opened Iwatake Terrace via gondola at Hakuba Ski Resort for a stunning panoramic view. This evening, be treated by the traditional Japanese Kaiseki Dinner and be entertained by a Local Taiko Drum Performance Show at Ski Resort. Spend the night at an onsen hotel in Hakuba. After breakfast, get some action packed at powdery ski fields. Channel your inner athlete as you hit the snow slopes with your friendly ski instructor. First-timers have no fear! 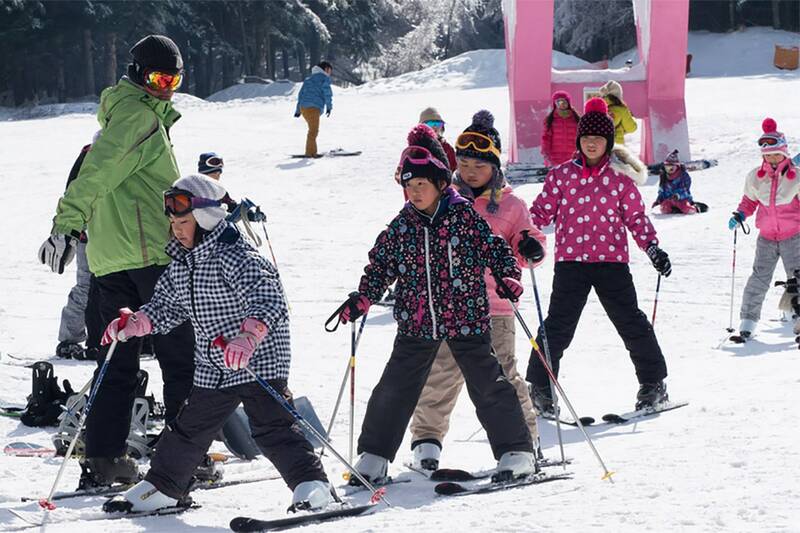 A 2-hour basic ski lesson by a licensed English or Mandarin speaking instructor will be provided. Not into skiing? Try your hand at a multitude of other snow activities such as snow rafting and snow shoe trekking at your own expense. For everybody else, there is always the ever-popular snowball fight up at ski field. Today, head to Kusatsu, a small town that boasts the largest volume of flowing water among all the hot springs in Japan. Taste the onsen specialty snack, Onsen Manju, steamed soft bun filled with red bean paste. Enjoy a traditional Yumomi Performance in Yubatake and witness the traditional pre-bathing ritual where the hot spring water is cooled down to bath temperature while local folk songs and dance are performed. This evening, indulge in a well-earned hot spring bath of your own at an onsen resort in the premier resort town Karuizawa where scenic views and leisure activities abound. Start the day at Karuizawa Prince Shopping Plaza, a massive outlet mall. This is where the real shopping begins! With over 200 popular brands and speciality stores selling anything from the latest trends to outdoor wear, house hold and luxury goods, it’s time to summon the inner shopaholic in you and relax those purse strings. Unleash the inner heritage buff in you at Kawagoe, popular amongst locals with its well-preserved little Edo town with rows of magnificent merchants’ houses in the traditional storehouse style. There are Penny Candy Alley where sells Japanese candies, sweet potato cakes, rice crackers and other snacks on both sides on the stone-paved lane. Their simple, nostalgic tastes will satisfy both your tongue and heart. End the day with a leisure drive to Tokyo, the world’s largest metropolis. From 01 – 30 Dec (starts from 4pm): Enjoy spectacular illumination at Seibu Amusement Park. From Jan to Mar – Illumination is only available on Friday, Sat & Sun. In the event of park closure, The tour will replace with Shinjuku Shopping. After breakfast, spend the day at leisure. Take your pick from the maze of contrasting yet complementary neighborhoods in this dynamic city – the towering skyscrapers in Shinjuku, vibrant youth subcultures at Shibuya and Harajuku, culture, and many shops and establishments devoted to anime and manga are now dispersed among the electronic stores in the district in Akihabara or the polished bling of Ginza. Tokyo never fails to surprise, intrigue and delight! Alternatively, join an optional one day tour to Japan’s highest mountain, the iconic Mt.Fuji area.